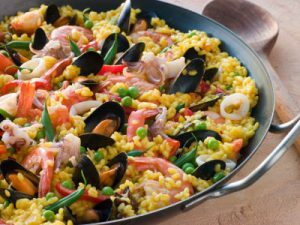 There are many versions of this celebrated Spanish rice dish. The typical Spanish paellera – a wide, round, shallow pan (10cm deep, 30cm diameter), preferably heavy with a flat base – gives this meal its name. 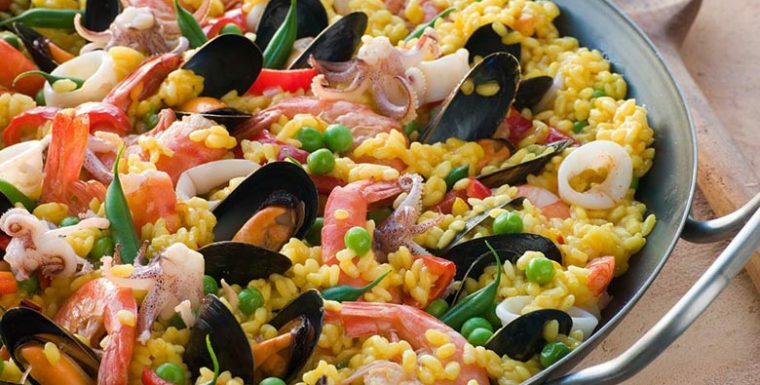 In south-eastern Spain, in the seaside regions of Valencia and Alicante, paella is the favoured Sunday lunch. During the summer months, in restaurants catering to the locals and tourists, there is a brisk Sunday trade in paellas. Late in the afternoon, when the traditional meal is finally over, you will see rows of metal paella pans, of assorted sizes, all burnished and gleaming, arranged in racks and left drying in the sun outside kitchens and courtyards. In your pan, warm 3 tablespoons olive oil. Fry the chicken pieces, seasoned in salt and pepper, and cook gently for about 12 minutes, turning regularly to ensure an even golden brown finish. Set aside on a plate. In the same oil, fry the peeled and chopped tomatoes; stir in the chilli sauce. Now add the water. When it comes to the boil, put back the chicken and simmer gently for 10 minutes. Add the rice, the prawns, salami, & the beans (topped & tailed & cut into 3cm lengths). Cook steadily for 15 minutes. Sprinkle in the saffron and salt. In another 5 to 7 minutes, the rice should be cooked, but timing depends on the quality of the rice, and the size & thickness of the pan etc. If the water has evaporated before the rice is cooked, add a little more. If there is too much liquid by the time the rice is ready, increase the heat & cook fast until the rice is dry. The rice should be a beautiful yellow colour, and although moist, each grain should be separate. If it is necessary to stir, use a fork, not a spoon, which may break or mash the rice. To this basic mixture can be added other ingredients such as diced pork, mussels, other shell-fish, artichoke hearts, green peas, red capsicum, sausages, snails, rabbit etc.